For the manufacturer of medical equipment, see Laerdal. Lærdal is a municipality in the southeastern part of Sogn og Fjordane county, Norway. It is located on the south side of the Sognefjorden in the traditional district of Sogn. The administrative center of the municipality is the village of Lærdalsøyri. The old Filefjell Kongevegen road passes through Lærdal on its way to Valdres and later to Oslo. The 1,342-square-kilometre (518 sq mi) municipality is the 66th largest by area out of the 422 municipalities in Norway (with over half of this area consisting of mountains). Lærdal is the 316th most populous municipality in Norway with a population of 2,159. The municipality's population density is 1.7 inhabitants per square kilometre (4.4/sq mi) and its population has increased by 0.3% over the last decade. The Lærdal river valley is long, running from Hemsedal (Høgeloft mountain) and the Filefjell mountains in the east to the Sognefjorden in the west. About half of the municipal residents live in the main village of Lærdalsøyri; the rest in the small villages in the surrounding valleys such as Borgund, Ljøsne, Tønjum, Erdal, Vindedalen, Frønningen, and Strendene. The Old Lærdalsøyri village has 161 protected buildings. Some of the houses there date back to the mid-18th century. On the night of 18–19 January 2014, a major fire destroyed at least 30 buildings. Lærdal was established as a municipality on 1 January 1838 (see formannskapsdistrikt). In the 19th century, the name was sometimes spelled Leerdahl or Leirdal. The municipality of 1838 was created to be identical to the Lærdal parish (prestegjeld) that included the sub-parishes (sokn) of Borgund, Tønjum, Hauge, and Aardal. In 1863, the northeastern sub-parish of Årdal (population: 1,791) was separated from Lærdal to form a separate municipality. In 1864, the eastern sub-parish of Borgund (population: 963) was separated from Lærdal to form its own municipality. This left Lærdal with 2,777 residents. During the 1960s, there were many municipal mergers across Norway due to the work of the Schei Committee. On 1 January 1964, Lærdal (population: 1,755) was merged with the municipality of Borgund (population: 492) and the Muggeteigen, Luggenes, and Bergmål farms (population: 11) along the Sognefjorden from the municipality of Årdal. After the merger, Lærdal had a total of 2,258. On 1 January 1992, the Frønningen area (population: 32) of Leikanger municipality was transferred to Lærdal municipality. The Old Norse form of the name was Lærardalr. The first element is the genitive case of the old name of the river Lærr (now the river is called Lærdalselvi) and the last element is dalr which means "valley" or "dale." The meaning of the old river name is unknown. The coat-of-arms is from modern times; they were granted on 18 December 1987. It is red with two gold-colored Norse dragon heads. 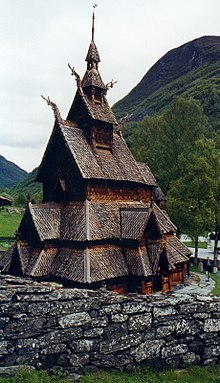 The dragon heads are based on the wooden dragons seen on the gables of the historic Borgund Stave Church in Lærdal. The Church of Norway has three parishes (sokn) within the municipality of Lærdal. It is part of the Indre Sogn deanery in the Diocese of Bjørgvin. All municipalities in Norway, including Lærdal, are responsible for primary education (through 10th grade), outpatient health services, senior citizen services, unemployment and other social services, zoning, economic development, and municipal roads. The municipality is governed by a municipal council of elected representatives, which in turn elect a mayor. The mayor (ordførar) of a municipality in Norway is a representative of the majority party of the municipal council who is elected to lead the council. The mayor since 2011 is Jan Geir Solheim of the Centre Party. Lærdal is located southeast of the Sognefjorden and east of the Aurlandsfjorden. The municipality is centered on the Lærdalselvi River with the Filefjell and Hemsedalsfjell mountain ranges on its east. Lærdal is bordered in Sogn og Fjordane county by the municipality of Aurland to the southwest, by Sogndal to the northwest, and by Årdal to the north. It is also bordered on the east by Vang (Oppland county) and Hemsedal (Buskerud county), and in the south by Ål and Hol (both in Buskerud county). The lakes Eldrevatnet, Juklevatnet, and Øljusjøen are located along the southeastern border, south of the mountain Høgeloft. The Lærdalstunnel was built through the Aurlandsfjell mountains dividing Aurland from Lærdal. The tunnel is the worlds longest (as of 2008[update]) at 24.5 kilometres (15.2 mi). Construction began in 1995 and was completed in 2000. The River Lærdalselvi was traditionally one of the most exclusive salmon and sea trout rivers in Norway. Known by the Norwegian King Harald V as his second Queen, the river has established Lærdal as one of the meccas of salmon and sea trout fly fishing, among others for the unusual fact that the river offers daylight fishing and dry fly fishing for sea trout. The salmon population was drastically depleted after an infestation with the salmon parasite Gyrodactylus salaris in the fall of 1996. After several treatments with aluminium sulfate, there are still problems with the parasite. In fall 2007, a smolt was again found infected by the parasite, and new treatments started in late March 2008. Because of this parasite, the river will be closed to angling for the 2008 season. The river has formed a large delta at Lærdalsøyri, where huge amounts of silt and sand have been deposited by the river. Although the area has been spoiled by some unfortunate landfills it is still a sight worth seeing. Lærdal has long traditions in farming, with the lower region of the valley being great for vegetable crops. Because of its dry climate it was one of the first places in Norway to begin the use of artificial irrigation. Despite having an inland climate, the water in the fjord keeps the winters from getting too cold. The local Western Norway Regional Health Authority hospital provides medical care for Lærdal itself and seven of the surrounding municipalities. The hospital, together with Opplysningen 1881 (directory assistance company), Østfold Energiproduksjon A/S and Norsk Hydro Aluminium Production Facilities in Årdal, are the major employers in Lærdal. The local government and health authority is trying to close this hospital due to cost cutting, which may have negative effects on the area. ^ "Blaze threatens historic wood village in Laerdal Norway". 19 January 2014. Retrieved 19 January 2014. ^ Jukvam, Dag (1999). "Historisk oversikt over endringer i kommune- og fylkesinndelingen" (PDF) (in Norwegian). Statistics Norway. ^ Natvik, Oddvar (9 February 2005). "Some historical data on the 26 Kommunes". Archived from the original on 13 June 2008. Retrieved 15 June 2008. ^ Rygh, Oluf (1919). Norske gaardnavne: Nordre Bergenhus amt (in Norwegian) (12 ed.). Kristiania, Norge: W. C. Fabritius & sønners bogtrikkeri. pp. 60–61. ^ "The world's longest tunnel". Statens vegvesen. Archived from the original on 17 May 2008. Retrieved 18 February 2013. Wikimedia Commons has media related to Lærdal.